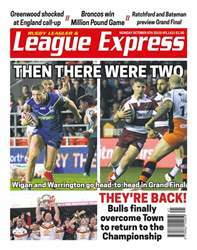 The new edition of League Express has all the thrills and spills from a thrilling weekend of Rugby Laegue action. Reports, photos and analysis from the two Super League play-off semi-finals. A report and photos from London Broncos' Million Pound Game triumph. And a full report and pics from Bradford Bulls promotion decider, as well as Featherstone's victory in the Championship Shield final. We have all the latest transfer and other news, as well as our regular columnists Martyn Sadler, Garry Schofield, Gareth Walker and Phil Hodgton, while Bev Risman tells his remarkable story to Richard de la Riviere in our Rugby League Heroes series.